The food truck visits Grow Benzie's Monday farmers market, and it also travels to other locations. Grow Benzie started nine years ago with a board of directors and a vision to better the community, leading them to create the four-acre nonprofit in just 90 days. Through grants, fundraising, volunteers, and immense support from the community, Grow Benzie renovated an abandoned greenhouse lot helping it grow into a place for people to gather for a seemingly endless number of reasons—a farmers market, food truck, life skills classes, a new edible trail and edible mini golf course, and so much more. “We are blessed with a unique space. This is more than a park,” says Josh Stoltz, executive director of Grow Benzie and a driving force of enthusiasm in the creation of the always evolving community space. 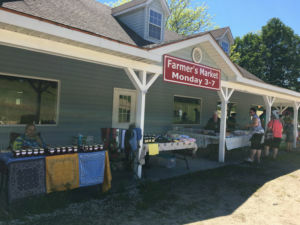 On Mondays from 3–7 p.m., a farmers market draws local vendors and customers, looping around the patio and main building with a variety of products. Honey made with Grow Benzie’s very own bee hives and produce from their three greenhouses are sold at the market. Now a year old, Grow Benzie also sports its own food truck which you can find at the Monday market. 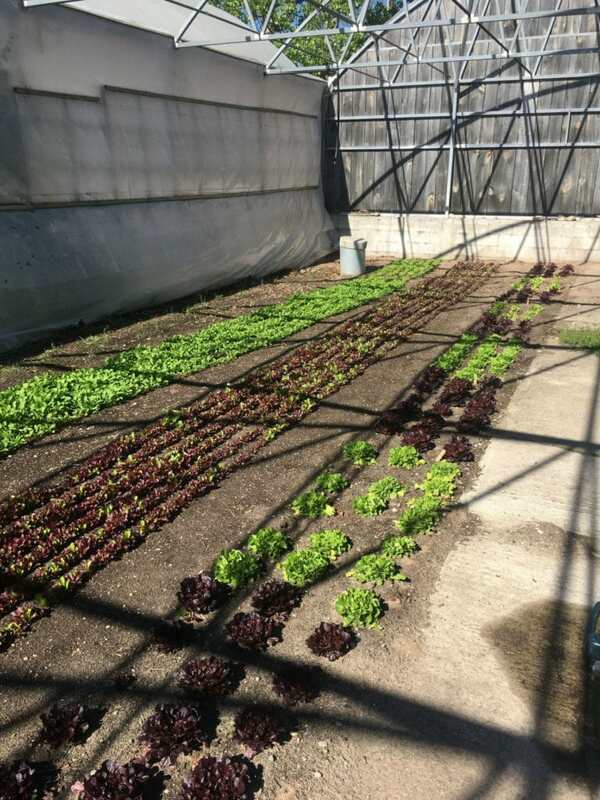 Most of the produce served comes from Grow Benzie’s market and the greenhouses. The truck sells a variety of wraps and breakfast bowls (try this grilled steak taco recipe featured last season). 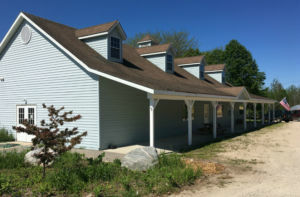 Many of the farmers market vendors create their products at the community center in a large kitchen space, certified by the state of Michigan and provided by the Michigan Department of Rural Agriculture and Development. Peninsula Pops makes good use of the space. The local company sells popsicles made with Michigan fruits and vegetables. Grow Benzie’s kitchen certification allows small businesses to sell their products not only at farmers markets but also in stores, which would not be allowed if the product was made at home. The large kitchen space provides community members a place to make consumer goods as well as an excellent spot for heathy cooking classes. 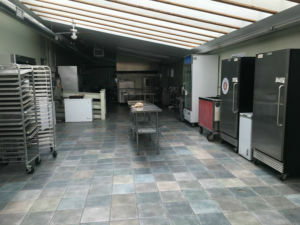 The kitchen is also used for catering companies, sports team dinners, and cooking classes. Before you shop at the market, attend one of the free cooking classes held every Monday, and learn how to make a healthy meal with instructions from a trained nutritionist. Here’s the class schedule. Several other classes are also held at Grow Benzie. 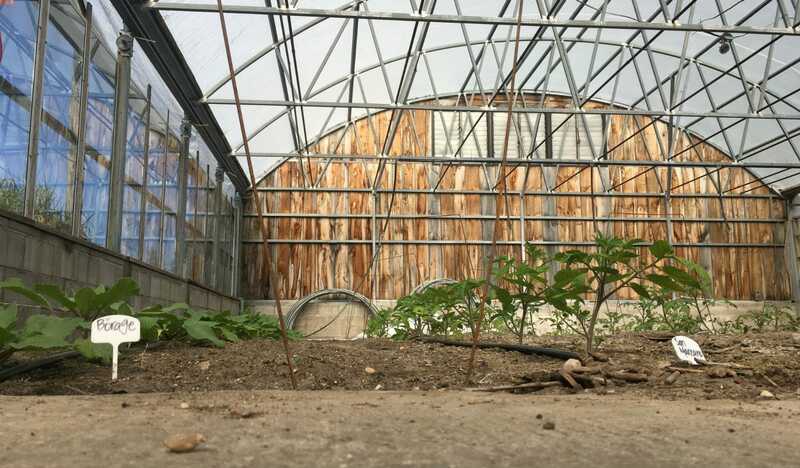 According to Stoltz, “The mission is to enrich the region by connecting people to healthy foods, jobs, life skills, and each other.” Classes include farming, wood shop, cooking, beekeeping 101, social media, and others are expanding all the time. Many of the events are free or ask for a suggested donation. The community center is a great place to rent for baby showers, wedding receptions, and other events. “Compared to any other rental space, this is the coolest place you could have for a reception or party,” Stoltz says. During winter, dinners are held weekly, drawing crowds of about 40 hungry and happy people. It’s a great place for organizations to gather and host meetings, such as the immigration discussion held last week with a packed audience of over 100 people. “We’re like a hub—we are a hub—for local organizations. The way it’s worked out is this is a space where a lot of these [organizations] connect and collaborate with each other. Some of the events that we have held spun off new connections,” Stoltz says. One such collaboration can be seen in the Sewing Studio. Part of the studio is used by about 20 volunteers who make feminine hygiene kits for Days for Girls. This project helps girls go to school while on their period in areas of the world where they would otherwise stay at home. 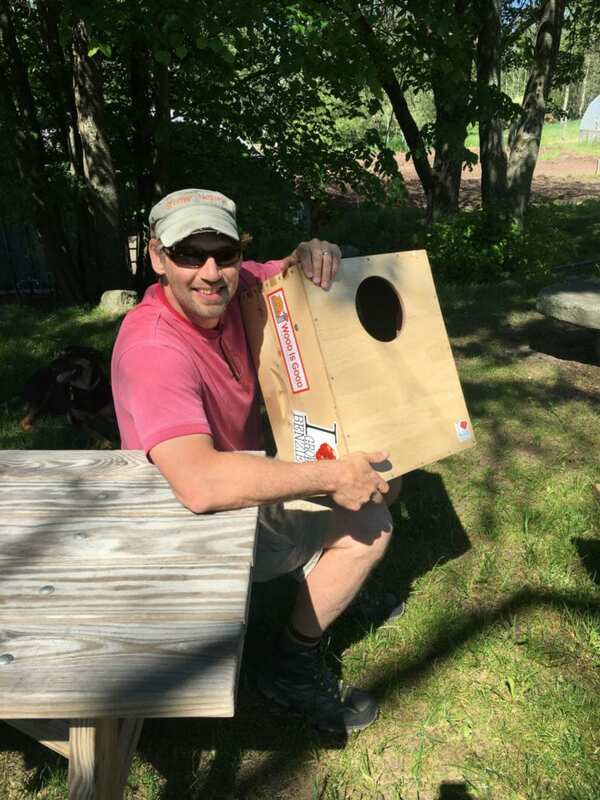 The kit includes underwear, soap, directions, and donated flannel and cotton from MI FiberShed, which are turned into pads made on the sewing machines. Over 400 bags have been sent to Malawi, Haiti, and India. Here is the backside of the edible trail, newly excavated. On the left, you can see part of the community garden with greenhouses behind it. On the right is where the 100 lily bulbs will be planted. A new attraction to Grow Benzie this year are their edible attractions, including a quarter-mile edible trail. 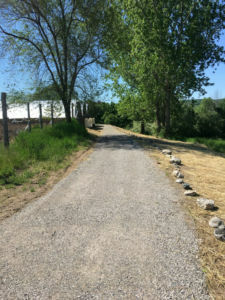 The Health Department of Northwest Michigan and Rotary Charities provided the grant for this project in order to expand the green space. The trail starts at a gazebo overlooking the valley, which is wrapped with kiwi vines extending up the pillars creating an intertwined living vine roof. A big treasure map will cover the side of the gazebo showing the path of the trail and locations of other fun things throughout the property. The trail will feature a lily lane with over 100 edible lilies donated by Betsie River Lily Farm. It’s the perfect summer adventure for all ages! 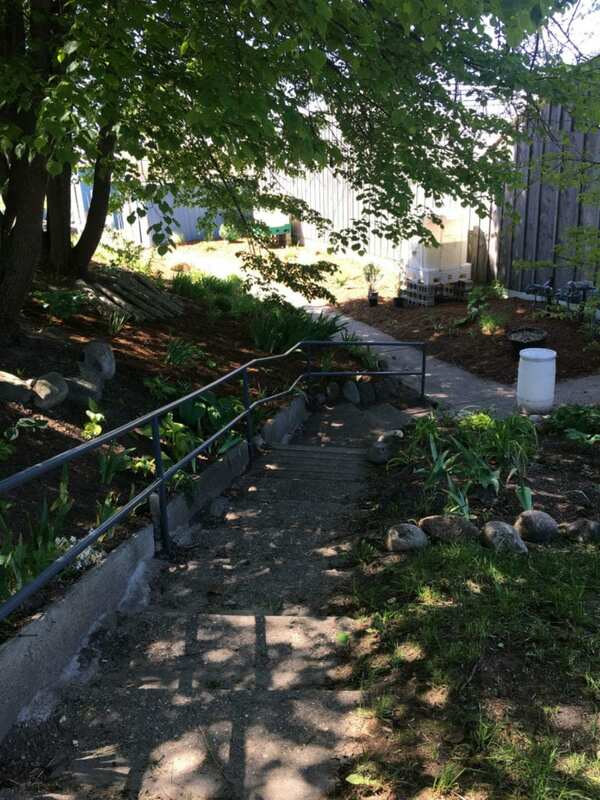 “People are just showing up with more donations, like the lilies; that was just Di from the Lily Farm saying, ‘Hey would you be interested?’ And then people call with their other plants and herbs so we are just going to turn [the trail] into a walking jungle. The great thing about it is the community is participating,” Stoltz says. 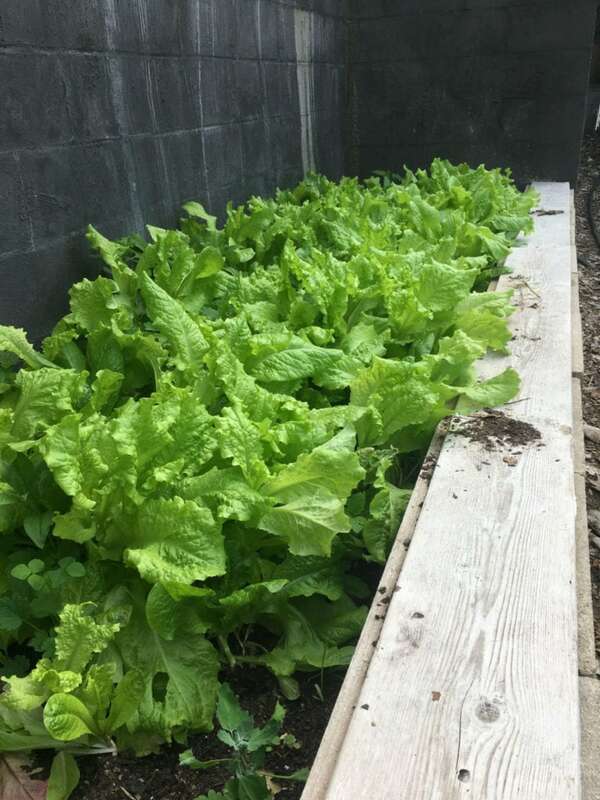 The SEEDS youth program was hired to build the raised beds and help design the golf course. 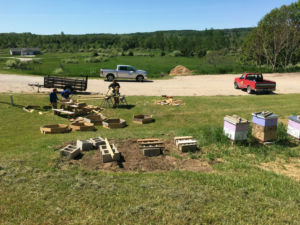 On the right, you can see the beehives, housed in bee boxes made by Hive Minded, an after school wood shop program at Benzie Central. Near the start of the trail is another new edible attraction: a 9-hole mini golf course. The course, along with the gazebo, is being built by SEEDS Youth Conservation Corps and Sacred Earth Landscaping using black locust wood. Several different berries and fruit trees will be spread in and around the golf holes, creating obstacles and snacks to enjoy while you play! Not only does the golf course provide a fun place for the community, it also promotes a healthy lifestyle. “The big thing for Grow Benzie now is to build up our membership base. We’ve been getting grants—we did receive another grant from the Allen Foundation for Video Production and Social Media. That’s gonna help us build our membership base,” Stoltz says. Click the cover for travel tips, best restaurants, beaches & more in the FREE Benzie Vacation Guide!